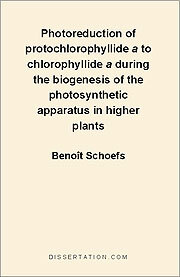 This thesis is divided into 4 chapters summarizing this contribution on selected topics related to chlorophyll biosynthesis and biogenesis of the photosynthetic apparatus. The first chapter deals with the state of Pchlide in nonilluminated leaves. The comparison of the photoactive Pchlide absorbance spectra throughout the development in the dark, reveals that the proportion of P638-645 and P650-657 is not much modified during this period. The Gaussian deconvolutions of 77 K fluorescence spectra of nonphotoactive and photoactive Pchlide indicated the presence of three and 5 spectral forms, respectively. None of the nonphotoactive Pchlide forms is accumulated during the dark-growth. In constrast, photoactive Pchlide P650-657 is particularly accumulated. In the second chapter, we describe the photoreduction of Pchlide to Chlide. We conclude that the mechanism of photoreduction is independent on the leaf developmental stage. Using 77 K fluorescence spectroscopy, the Chlide spectral forms corresponding to the three photoactive Pchlides were identified. In leaves with proplastids, C670-675 is mainly formed whereas in leaves with etioplasts C684-696 is produced. During the 1st hour of greening, the newly formed Chlide molecules are not protected by carotenoids. The evidence for the involvement of a photocycle involving two spectral forms of Chlide in protection of newly formed Chlide is presented. In the third chapter, a method for the isolation of photoactive Pchlide yielding complexes characterized by spectral properties similar to those found in intact leaves is described. In the fourth chapter, it is explained that the different fates of the first products of the photoreduction, described in the 2nd chapter, influence the greening process. In fact, C684-696 is only produced in small amounts in plants with proplastids. Therefore the increase of the photosynthetic activity of these leaves is delayed. Nevertheless, during the first 8 h of greening, a weak photosynthetic activity is detected in these leaves. Fluorescence measurements reveal that a large part of the Chl remains nonintegrated to the photosystems. In young leaves, rapid Chl integration into the photosynthetic units occurs when both carotenoids and Chl are massively synthesized.